Hi! My name is Denis, and I’m 12 years old. I am Ally and Melissa’s brother and Lee’s cousin. 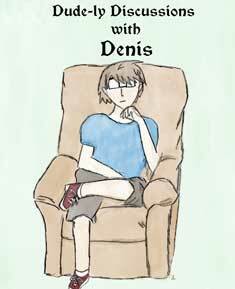 I’ll be occasionally doing a feature on the blog called Dude-ly Discussions with Denis. Today I’ll be reviewing the book Enclave by Ann Aguirre. In this world, you must live to age 15 to get a name. At this time, you get assigned a class: Builder, Breeder, or Hunter. Deuce was to become a Hunter, but to her misfortune, she gets stuck with Fade for a partner. Fade is an outsider who was brought into the Enclave because he is strong and smart. This misfortune will change Deuce’s life forever. The reason why Enclave really clicked with me was because I found it astonishing how one person could imagine the destruction of society and how people would act. I also loved how mysterious Fade’s life was and how he was found and imprisoned by the Enclave. I also liked how Deuce stood up for her friends when they were being exiled by the Enclave. When she sacrificed herself, though, her friends turned on her because they thought she was a traitor. I was shocked when the Enclave exiled both Deuce and Fade. I was also surprised when the gang leader Stalker joined Deuce’s group. Overall, Enclave was a good book, but I didn’t like how it ended so peacefully. I would recommend this book to anyone who enjoys dystopians or even if you like a good zombie book.